Hannah Winter is the 2018-2019 student executive president for Clarkston High School. As a senior, she has been involved in leadership for over three years, and enjoys the work the team does — not only for the school, but the community as well. During her time in leadership, Winter has learned the importance of teamwork in order to make things come together for dances, assemblies and events like Golden Throne. “I love Golden Throne and the spirit it brings. Getting to see the two rivals working together to raise money for charity is really amazing,” Winter said. As Clarkston prepares for this year’s Golden Throne, the CHS student executive board members, which includes Winter and her teammates, have been meeting with LHS as well as local companies to gain sponsorships for charity. Although it’s bittersweet being her last year involved, Winter said she wants to leave a legacy with Clarkston High School. 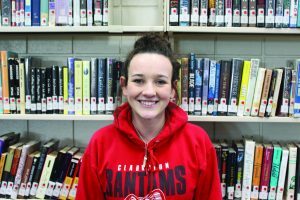 “I hope the legacy I leave here is that I made everyone feel welcome to CHS and [to] always remember that they can come and talk to me,” she said. After high school Winter plans to attend Lewis-Clark State College. She hopes to study secondary education and maybe even become the CHS principal in the future. CHS Executive president Hannah Winter looks back on her years in leadership. Photo by Abby Burgess.